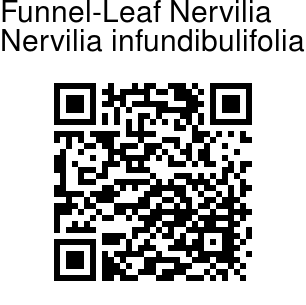 Funnel-Leaf Nervilia is a miniature sized, terrestrial orchid with a slightly flattened tuber. The tuber produces tall, straight stem with 2 internodes and linear-oblanceolate, pointed, wide sheath. Leaves are broadly heart-shaped, funnel-shaped, with crimped margins, minutely toothed, 5-9 veined, gradually narrowing below into the stalked base. The plant blooms in late spring and early summer on an erect, single flowered inflorescence. Flowers have a lanceshaped, pointed to long-pointed, concave, 3 veined floral bract. 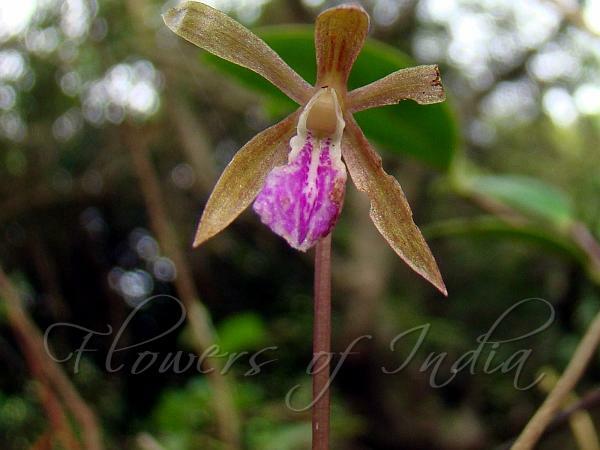 Flower arises singly on a leafless stem 5-15 cm tall. Flower is 3 cm across, greenish purple, carried on a cm long stalk. Sepals and petals are 1.3-1.5 cm long, 2-4 mm wide, maroon-green. Lip is also as long, but broader, 3-lobed. Mid-lobe is 10x6 mm, ovate, pink with dark patches. Funnel-Leaf Nervilia is found in the eastern Himalayas, Laos and Thailand, and south India, at elevations around 1700 m. Flowering: June-July.